UPPAbaby's RumbleSeat, Cruz and Vista strollers. 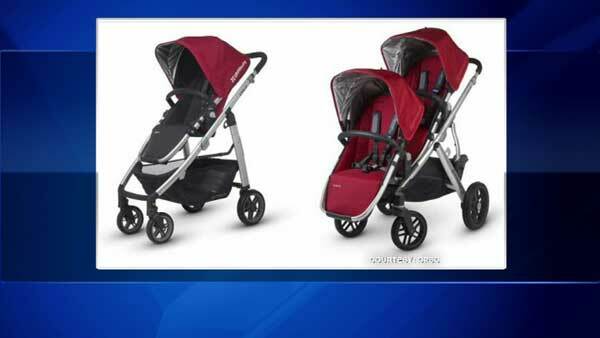 CHICAGO (WLS) -- UPPAbaby recalled 71,000 strollers and seats because of a choking hazard. Nearly two dozen children have bitten off the foam covering on a bumper bar in the front of the seat. The recall covers 2015 models of the Cruz stroller (about $500), Vista stroller (about $860) and RumbleSeat (about $170). They were sold at BuyBuyBaby and other retailers nationwide, as well as on Amazon.com from December 2014 to July 2015. UPPAbaby is offering a free fix. For more information, call (844) 540-8694 from 9 a.m. to 5 p.m. ET Monday-Friday, email contact@uppbaby.com or visit www.UPPAbaby.com and click on the Safety Notice.